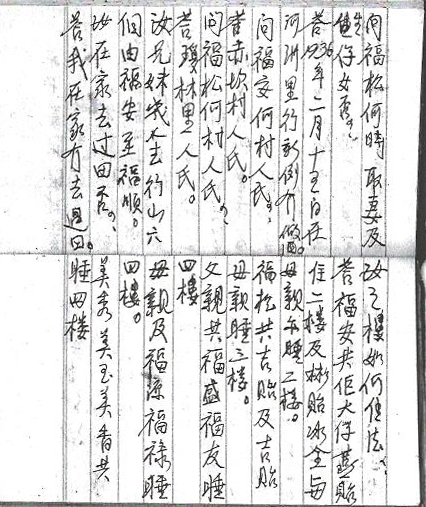 Ng Mee Seu Bow, Note in Chinese, 1939; Chinese Exclusion Act case files, RG 85, National Archives-Seattle, Ng Mee Seu Bow, Box 796, Case 7030/12456. Ng Mee Seu Bow, a 17-year-old student, arrived in Seattle with her mother, Wong Shee, on 6 October 1939 on the SS Princess Charlotte. They were on their way to New York City. While searching Ng Mee Seu Bow’s belongings, the matron at the immigration station found this booklet and a crumpled note written in Chinese in a wicker basket. Several packets of medicine were also in the basket. An interpreter was called to review the items. There is no comment in the file about their findings. Ng Mee Seu Bow was admitted with no further delay as a native. Her file mentions her birth certificate and certificate of identity, #79995.